As discussed in the note to the previous lot, the oeuvre of the anonymous Master of the Female Half-Lengths is now believed to represent in large part the product of a workshop, specializing particularly in small-scale panels of aristocratic young ladies in half-length and devotional scenes. They are shown reading, writing or playing musical instruments, usually in a wood-panelled interior or against a neutral background; some of the women, including that in the present in picture, are represented with an ointment jar, the attribute of Mary Magdalene. The workshop also produced a group of landscapes that clearly show the influence of Joachim Patinir, such as the previous lot. 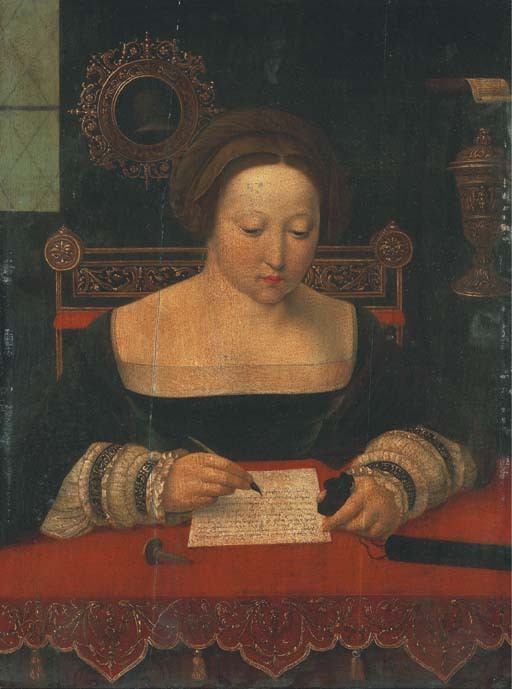 The present work would seem closest stylistically to a Magdalen recorded by Max Friedländer, in his Early Netherlandish Painting, XII, Leiden and Brussels, 1975, no. 94, fig. 43. Both models show the idiosyncratic embroidered sleeves that recur in two other works by a different workshop hand (ibid., nos. 90 and 91) and all appear to be based on those in the epicentral painting of the workshop's production, the Three Woman Musicians in the Graf Harrasche Gemäldegalerie, Schloss Rohrau (ibid., no. 106). This clear borrowing reveals the close co-operation of the various hands operating in the workshop: another example being the mirror in the background of the present work, a motif that is shared with another Magdalen recorded by Friedländer as his no. 105.